Irrigation water is applied to turfgrasses largely to replace water used in evapotranspiration (ET) by turfgrass in excess of rain and soil moisture reserves. Methods of irrigating or “watering” turfgrasses have included flood (especially in heavy clay soils), subsurface (seepage in humic soils or by underground emitters), and, most commonly today, overhead irrigation by sprinkler heads placed at ground level. Rotary heads deliver one or more aerial streams of water. Spray heads deliver finer particles in a fan-like configuration. 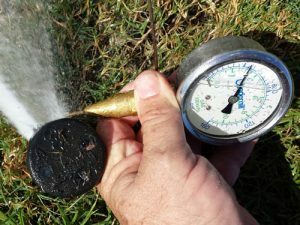 Sprinkler heads in turfgrass are often rotary or spray heads spaced at appropriate distances for even coverage and pressurized by a system of pipes controlled by valves. In typical overhead irrigation by sprinkler heads, water source may be municipal treated water, reuse water, or shallow or deep well water pressurized with local pumps, or open surface water from canals and lakes. Water quality and quantity are important in turfgrass growth and in providing a reserve for allocation to other uses.